Finally the price of 107FL F3.9ED complete package has been set and now we are ready to pleasingly take orders from today. We are scheduling to start shipping worldwide end of this month. So it should be available at your local dealers almost same time as well. Here is the price in USA. Back focus : 80.0mm from M68.8 female section. Optical back focus from a rear lens is 177.5mm. First, I’d like to thank to the people who have been patiently waiting for this announcement. 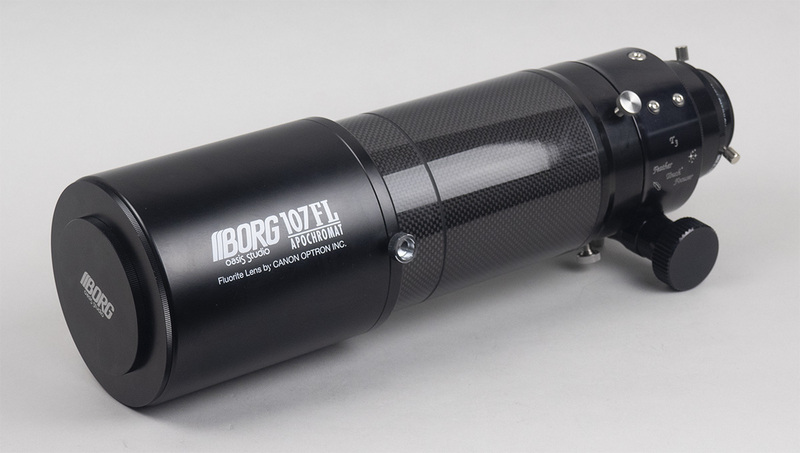 This is my first BORG telescope I was deeply involved myself, as a decision maker, mainly in mechanical sections from the early stage of development time. So you might feel something different from the classic BORG style. I’m sure this should be a very unique 4″-plus airline transportable telescope, which is the perfect for the overseas expedition. Personally I’m wishing to take this astrograph and Fuji GFX 50R camera to the southern hemisphere some day. That is my current dream. As shown above, a carrying bag is wide enough for a motor unit or guide scope setup. The price of F3.9 conversion kit for existing 107FL users will be announced shortly. Also I will write up the recommended mounting rings. I’m sure this ring size is widely available at most of astro shops, including Hutech. So far, no BORG-made rings are scheduled yet. BORG and I have made the dream machine for you at present our maximum efforts and “at the affordable price” (I hope you agree….). I really wish you will enjoy fluorite-created high color contrast and transparent images at F3.9 speed anywhere on our globe. ~ by tedishikawa on October 2, 2018. Whats the backfocus of it? Currently looking around my room thinking of what I could sell. It’s 80.0mm from M68.8 female section. Optical back focus from a rear lens is more than 170mm. So there is a plenty of room. I forgot describing on a page. I will update that. Would it be possible to order one without a focuser? 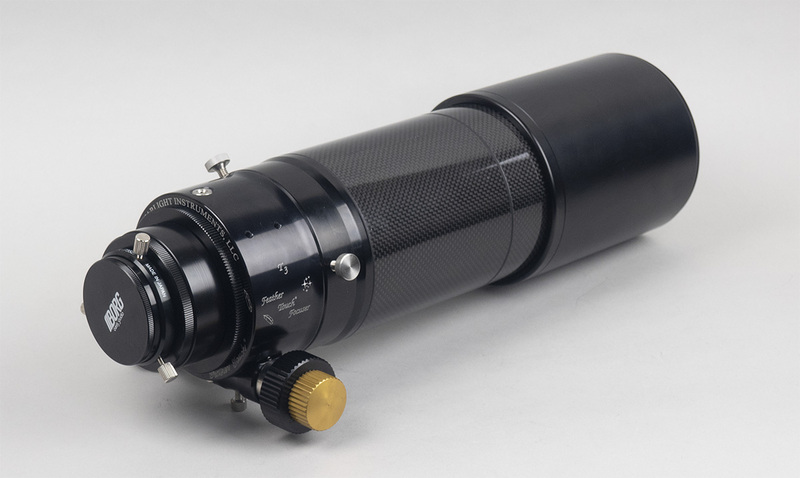 My camera setup uses 101mm so I would be needing a much shorter focuser than that FT. Yes, we can ship without a focuser and its adapters. But things are not as simple as you might expect. 1. Although I mentioned the length has more than 170mm, it doesn’t mean any 0 – 170mm are OK. Still you have to set the focal plane at a specific distance. yourself. I can specify the length based on your requirement though. This is 1st point. the objective lens. It means you have to shorten a foucser or main tube. Original tube is 240mm long. But we can provide 210mm long tubes. In this case, you don’t have to change a focuser. In any cases, you have to prepare a specific length of reducer tube. For more details, please e-mail to me. Beautiful looking scope. I’m interested ! Can i use its modularity to remove the reducer / flattener and buy parts to use it, both with imaging and visual, at its native focal length ? Yes, here is my initial tests for various configurations. We plan to prepare for some other parts to re-configure. Very nice! Where is the ED glass in this design? Is it the outermost element, or is the FL glass the outermost element? Which kind of glass is exposed to the outside environment in other words? 1st element is fluorite. ED is set inside a focuser. This looks very intriguing. Has just the right characteristics to fit my needs. I am curious, are there any example images? I am particularly curious about the color correction, especially in the blue end of the spectrum. I hope these will be useful for your study.